Asian Beef with Mushrooms & Snow Peas – delish and easy-to-make! 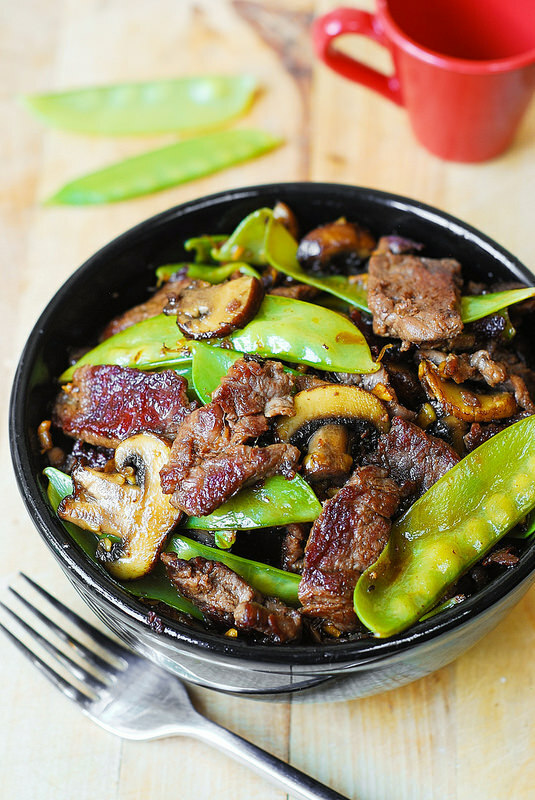 Tender mushrooms, crisp snow peas, and thinly sliced sirloin steak strips sautéed in garlic. This delicious gluten-free recipe is my new favorite homemade Asian dish! Mushrooms go beautifully with beef, snow peas and Asian sauce. 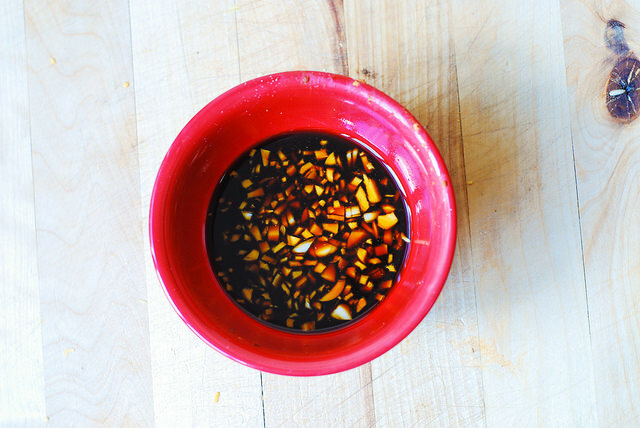 Here I’m using Tamari sauce to make a base for a stir fry sauce. Tamari is basically a gluten free version of soy sauce, but regular soy sauce is much saltier than tamari. 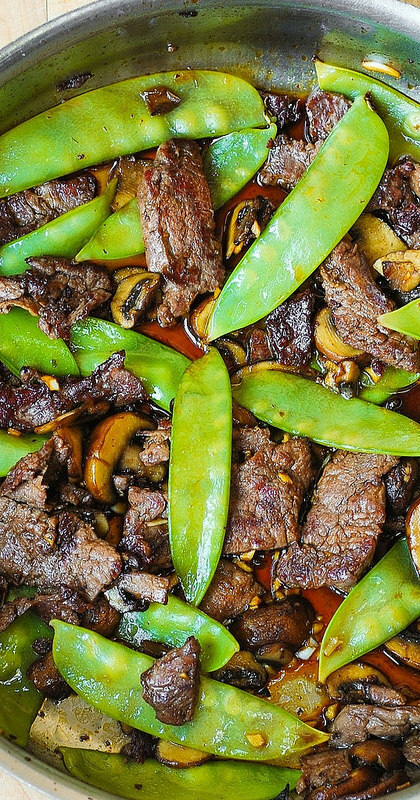 Keep that in mind, if you decide to use soy sauce in this recipe – if you do, use low-sodium soy sauce, or use less of soy sauce and more olive oil (or water it down with water) and don’t salt the meat or vegetables during the cooking process. You can use pretty much any type of beef in this recipe as long as you slice it thinly: flank steak, sirloin steak strips, any other kind of steak, or boneless beef. I find it the easiest to thinly slice the beef while it’s still partially frozen and thawed just briefly in the microwave. That keeps beef pretty solid and makes slicing the meat thinly a pretty easy task. 1/Combine all the sauce ingredients in a bowl - whisk to combine. Set aside. 2/Bring water in a medium pan to boil. Add snow peas, boil them for 5 minutes, drain. Set aside. 3/Heat a large skillet until hot, add 2 tablespoons olive oil - it should sizzle. Immediately add thinly sliced mushrooms - cook them on high heat, turning occasionally, until they brown nicely. Salt them midway, a little bit (not too much salt, as you will be adding tamari sauce later). 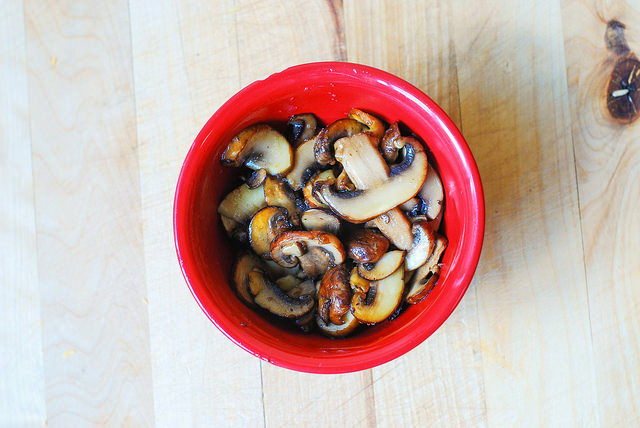 Remove mushrooms to a bowl. 4/To the same skillet, on high heat, add 2 tablespoons of olive oil, which will sizzle right away. Immediately add thinly sliced meat. You might want to do this in 2 batches, because you will want each slice of meat to touch the bottom of the skillet and for meat slices not to be crowded. This will ensure that meat will brown on high heat. Cook meat on one side until it browns nicely. Turn over all meat slices to the opposite side, and cook more, on high heat, until all slices brown nicely. Remove this batch to a bowl. Add a second batch of meat, and repeat. 5/Return all of the cooked meat back to the skillet. 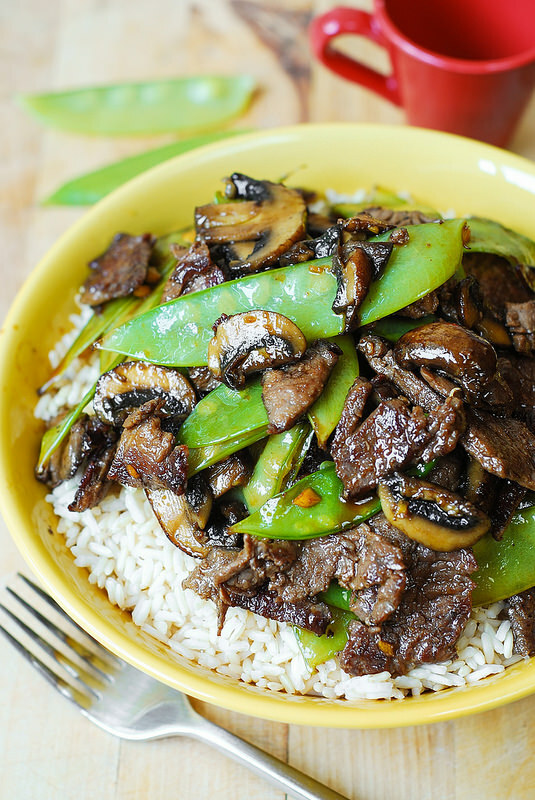 Add the snow peas and cooked mushrooms, then the sauce. On high heat - stir everything to combine, for about 1 minute. Turn off heat. Cover the skillet with a lid.